Fog lifts from the banks of the Colorado River as the peak of Baker Mountain catches a first glimmer of sunlight on a cool but beautiful morning in the Kawuneeche Valley of Rocky Mountain National Park. 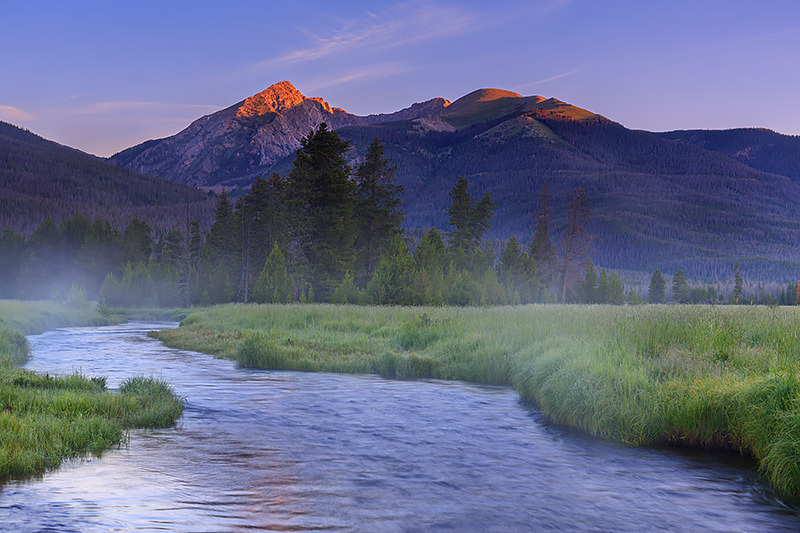 Only a few miles from its headwaters, The Colorado River cuts through the vibrant Kawuneeche Valley located on the west side of Rocky Mountain National Park. Moose, Elk and Deer are common through the meadow and willows of the valley but the name 'Kawuneeche' is derived from the Ute Indian work for 'valley of the coyotes'. Photo © copyright by Thomas Mangan.